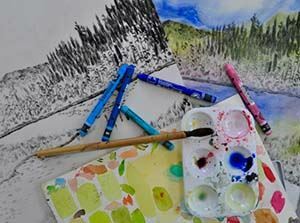 In this environmentally friendly Drypoint & Monoprinting Workshop, you’ll draw your image onto plates using an etching needle (drypoint) and add colour by painting with printmaking inks on plates (monoprint) to create fabulous original prints using a small etching press, which is fun and easy to use! You’ll learn about water wash-up non-toxic inks and print on traditional Western and Japanese papers. Make limited edition prints, artist’s books, or simply explore printmaking to expand your practice. The possibilities are endless! Bring plant material, photographs – anything that will inspire you to create unique original handmade prints. Beginners are welcome.